People long for meaningful connections and will pursue them in a multitude of ways. This is at the core of all the social networks - Facebook, Twitter, MySpace, Instagram, LinkedIn, eHarmony, Match.com, et al. Who do I know? And, just as importantly, who knows me? People are communal beings - we need each other. We also look for meaning in our lives. As these 2 things merge, local churches play a significant role - if they are prepared for it. Applications and search results are becoming very localized - providing different results for the searcher, depending on their place and time. 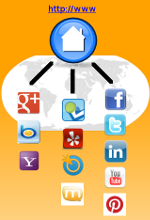 All organizations need to center their online (searchable) content around their location and their website. Has your church prepared itself to be a place of community for people seeking meaning in your area? We'll give you an overview of the local search landscape and how you can become a better online neighbor.